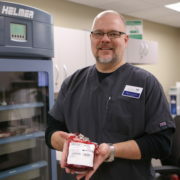 As laboratory manager at Jefferson Community Health & Life in Fairbury, Dan Reikofski sees the need for blood regularly. But in June 2016, after experiencing excessive tiredness and dizzy spells, he found himself in need of blood. Doctors couldn’t pinpoint the cause of his discomfort but his hemoglobin levels – the proteins that transport oxygen in your blood stream – and his blood pressure were slowly dropping. When his hemoglobin reached 9 (the normal range for men is 13-15) his doctor sent him back to Jefferson Community Health & Life, this time as a patient, for overnight observation. When he woke up, his blood pressure had bottomed at 40/20 and his hemoglobin had plummeted to 6.2. That’s when he received his first blood transfusion. Because of the unexplained symptoms, Dan was transferred to Bryan West in Lincoln, where he spent a week in the Intensive Care Unit and received several more units of blood. Once his hemoglobin had returned to a healthy level, he was able to return home. Today, Dan is grateful for his blood donors who have given him more time to spend with his wife Sandy and their three children Kyle; Hannah; and Zach. As a lab professional he’s known having blood on hand is important, but living through an experience where he was dependent on blood to survive has made Dan become an even bigger advocate for local blood donation. 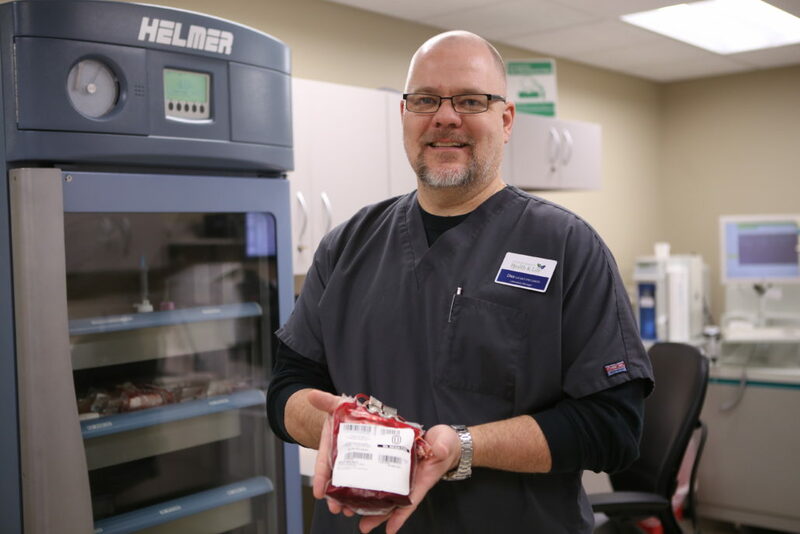 Because of generous blood donations from local Nebraska Community Blood Bank blood donors, Jefferson Health is also able to perform major surgeries so patients do not have to leave town for treatment. The hospital can also respond quickly to the need for blood because of an accident or injury. Step up to help your neighbor through blood donation at the Jefferson Community Health & Life Blood Drive on June 4 from 9 am to 1 pm. Your donations also raise Hometown Hero dollars for the Fairbury community. The Hometown Hero’s program runs from Memorial Day to Labor Day and occurs during the summer months when collecting enough blood donations can be challenging. When blood drives meet their goal, NCBB donates money toward community projects. To make an appointment to donate blood contact Jean Smith at 402-729-6851 or call the NCBB at 877-486-9414. During June, all presenting donors will be entered to win Kansas City Royals tickets.